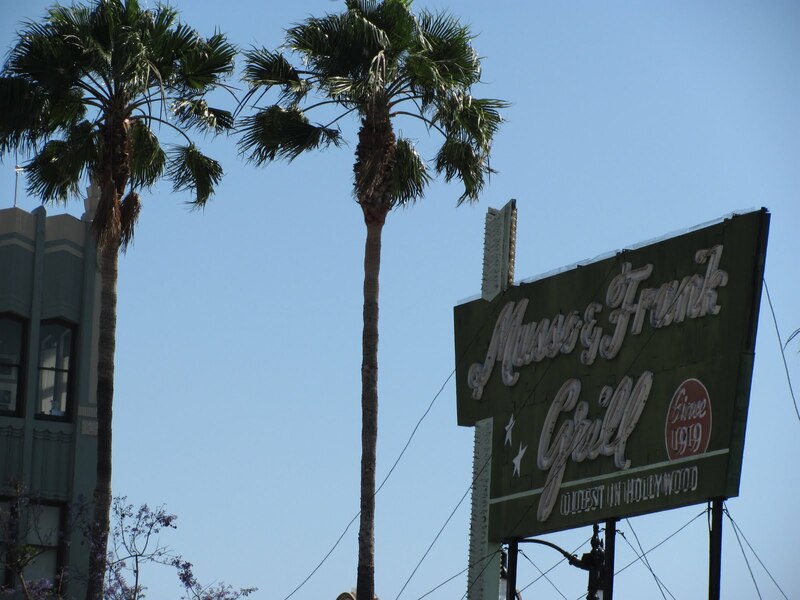 One of my favorite places in Los Angeles is, without a doubt, the Musso & Frank Grill. It has been in the heart of Hollywood since 1919 and is a landmark for LA. Musso's opened its doors during the dawn of the studio system and was located conveniently close to many of the lots. This is when Hollywood Boulevard was nothing more than a dirt road. 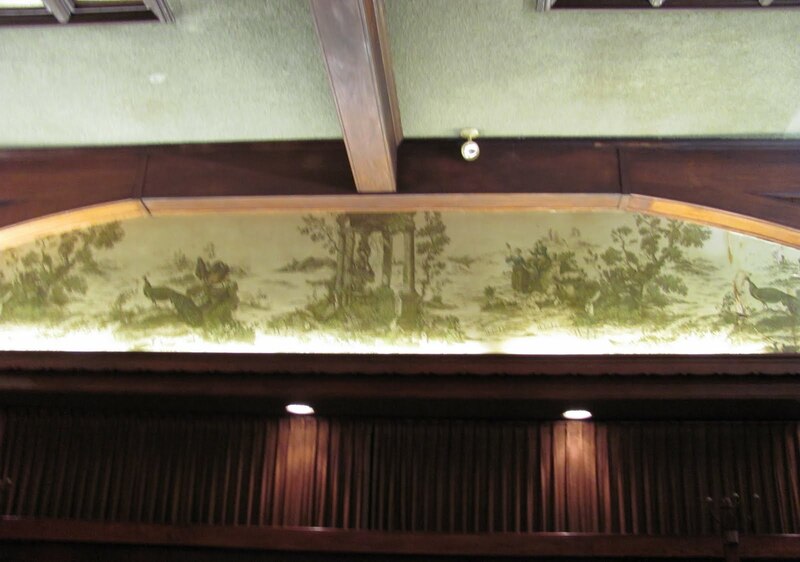 For those of us who love Hollywood history, the restaurant/bar is a bit of heaven, especially when it has outlasted its other famous contemporaries such as the Brown Derby, Ciro's, and Chasen's. I've been coming here for close to twenty years now, which is nothing compared to those associated with the restaurant. Most of the wait staff has been here 30, 40, and 50 years and everyone knows their names. The maitre d', Manny Felix, is a celebrity onto himself. And so, if you want to feel a bit of Old Hollywood, you must visit Musso & Frank. As you'll see in the story below, everyone has come here over the years for its atmosphere, classic food, and decadent drinks. There are two sides to the restaurant at Musso & Frank. 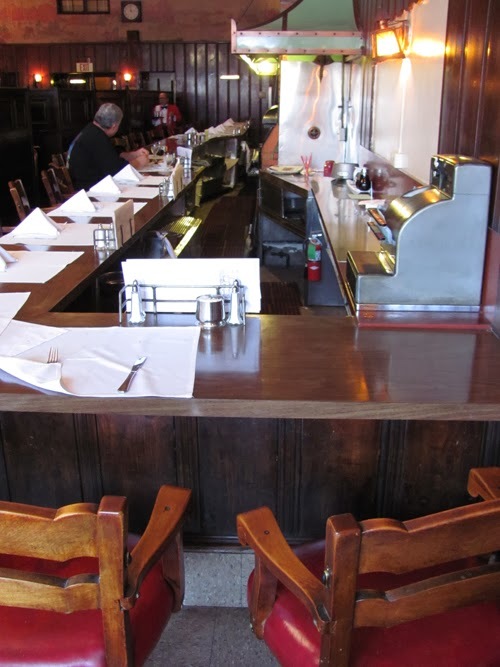 This side is called the Old Room and is distinguished by the breakfast counter (above, famous for its flannel cakes) and its red leather booths, which are matched by the sharp red uniforms of the wait staff. Famous folks have claimed these booths as their own over the years. Charlie Chaplin was one of the first. He loved Musso's so much that he used to have lunch here nearly every single day and always took the first booth near the window. Whenever Chaplin wasn't using his booth, though, it also became the regular spot for Rudolph Valentino and John Barrymore. Later Steve McQueen also claimed the same booth as his own. Of course many movies and television shows have filmed here. 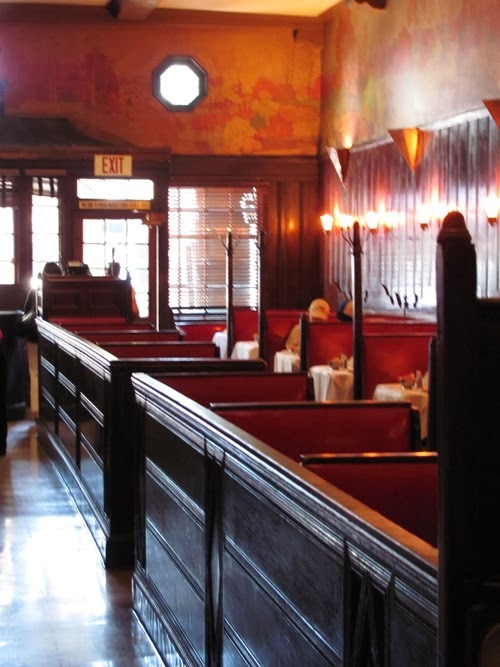 Most recently, Mad Men pretended that this side of the restaurant was Sardi's. You may remember the scene where Don Draper and Roger Sterling feasted on round after round of martinis and oysters...before heading back to work, of course. George Clooney and Brad Pitt also filmed Oceans 11 here, which is fitting considering that original Rat Pack members like Peter Lawford used to be regulars at Musso's. 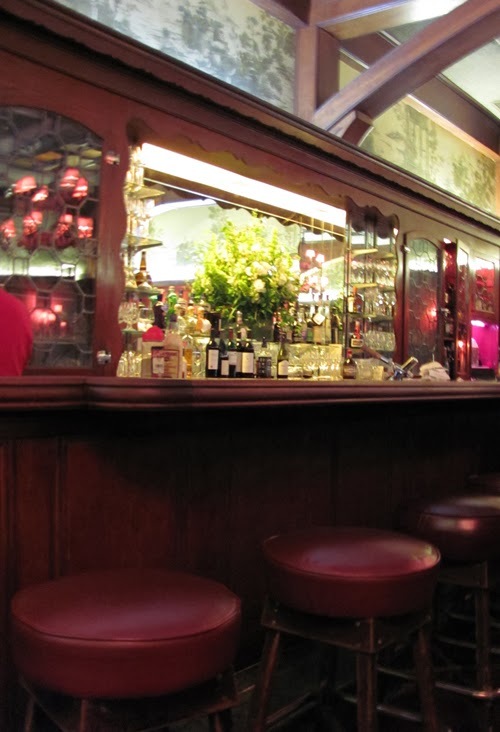 The other side of Musso's--the New Room--is dominated by their famous bar. Everyone--and I mean everyone--from Old Hollywood came and drank here. The stories are endless. For starters, in the 1920s, Rudolph Valentino and Douglas Fairbanks used to race one another on horseback from the studios down Hollywood Boulevard to Musso's. The loser bought the drinks. Others who loved to drink here? 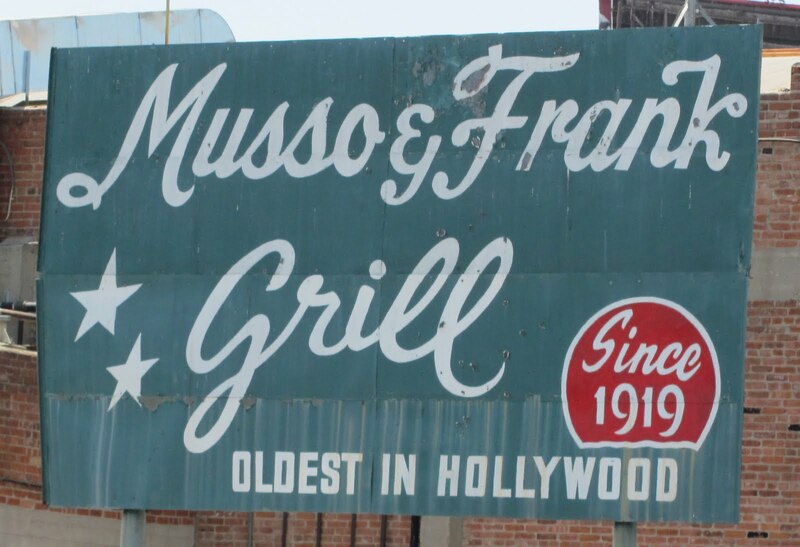 It should be no surprise that writers were particularly fond of Musso & Frank. After making their names as the great American novelists, Ernest Hemingway, F. Scott Fitzgerald, and William Faulkner all headed to Hollywood to make a little money as screenwriters. 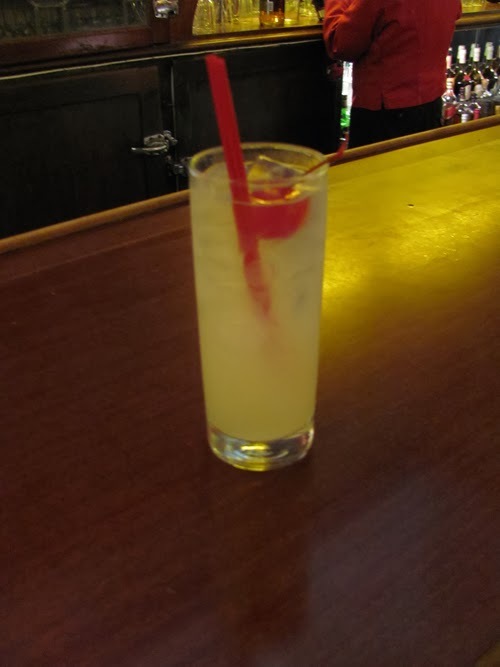 Unfortunately, they experienced varying degrees of success in this new role and were much more often drinking their lives away here at Musso's. Southerner Faulkner was such a regular and, quite frankly, such a drunk that they used to allow him to go behind the bar to make drinks for himself. Many many a mint julip, apparently. My favorite film noir folk--directors, actors, authors--all used to come here as well. John Huston, Humphrey Bogart, and Dashiell Hammett to name a few. 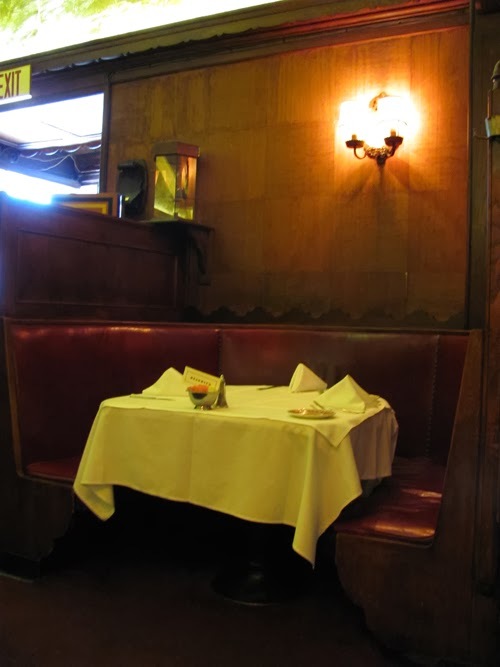 Raymond Chandler even wrote the novel for The Big Sleep while sitting (and drinking) in a booth at Musso's. Maybe it was the one above. 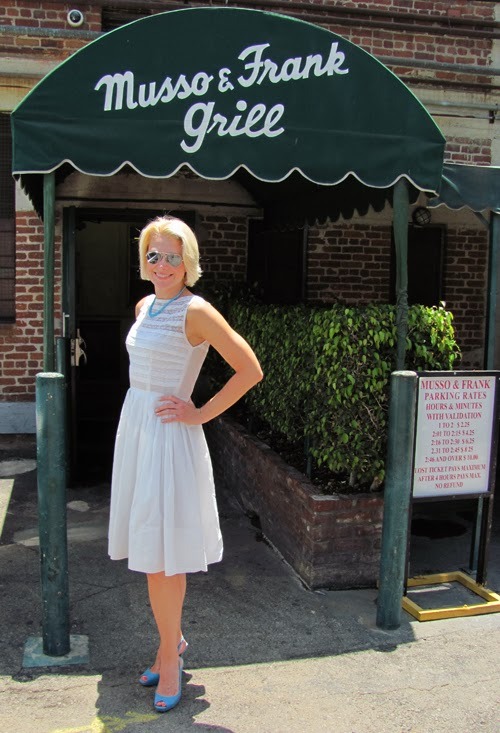 Of course the ladies loved Musso's, too. Greta Garbo, Bette Davis, Ginger Rogers, and Claudette Colbert were all regulars here. On my way out, I always think about them stopping to make a phone call from one of the wooden booths that are still lined up in back. Though it's time to say goodbye, it won't be for long. The time spent at Musso's is nothing short of magical, and the legacy of all who spent time there before me always lures me back. I hope you can experience it for yourself. You said: The maitre d', Manny Felix, is a celebrity onto himself. That would be UNTO himself. Being a fan of grammar (having taught writing many years ago), I love looking into things like this. The online resources I consulted as well as phone calls to a few of my English teacher friends have said that "onto" is actually perfectly acceptable the way I used it. Historically, "onto" has been interchangeable with "upon" and "unto" has been interchangeable with "until". Interesting, no? But I do think that "unto" works in the sentence as well, just as you suggest. I appreciate you reading my article so closely! Hope you enjoyed some of the photos and ideas inside it, too!